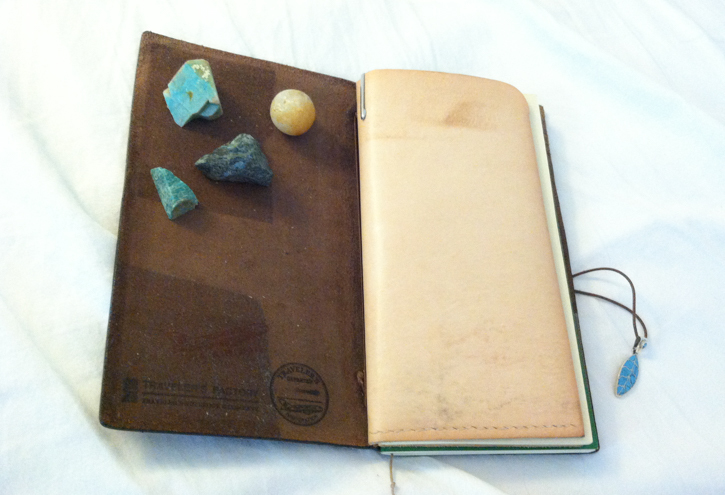 I think there is something really magical about Traveler's Notebook. It almost feels like it carries its own soul once it is used and loved. 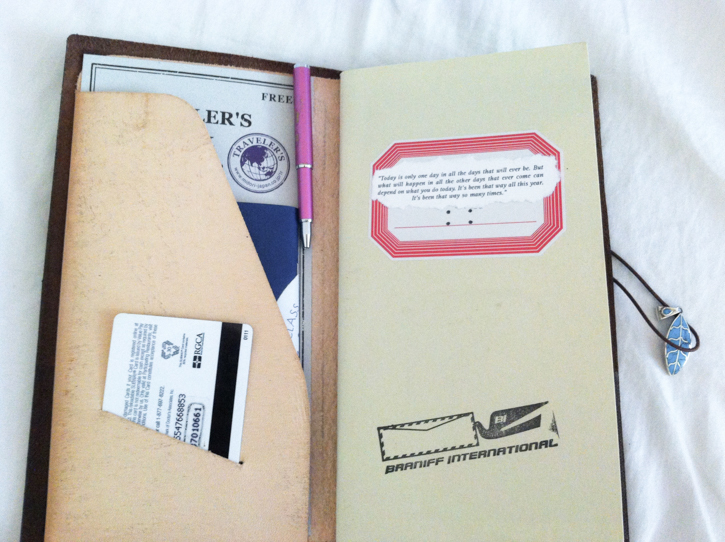 My 16 month old brown Traveler's Notebook, getting pretty and shiny by the day. I always wanted to stamp the inside of the cover. Got to do that finally when I visited the Travelers Factory in Tokyo this summer. You must recognize the quote on the cover of my first refill. 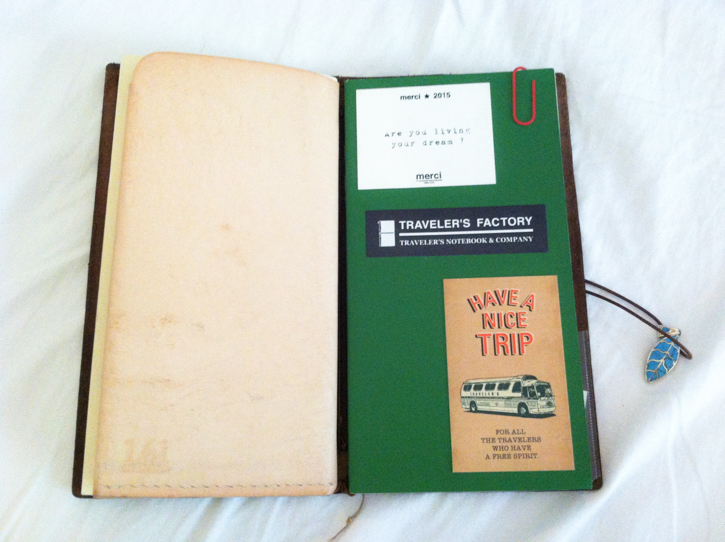 I just discovered this refill when I visited the travelers factory and it is called “short trip notebook”. It has only 32 pages (half of typical refills) and it is perfect for what I use it for. I own both [Essential] zipper case and [Portfolio] leather folder by 1.61 Soft Goods, but my favorite these days is the folder. I use the left side pocket to store passportsize notebook and a mini pen. 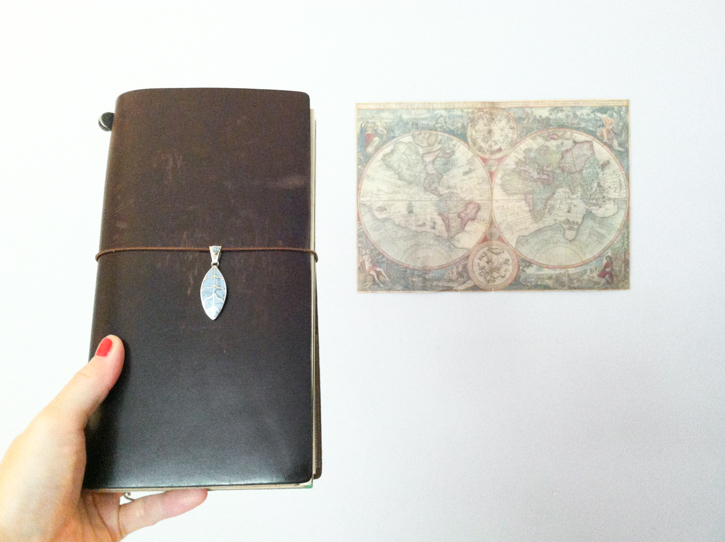 I use the passport size notebook as a jotter for things not so important and as a temporary place for ideas and to-do list. I use the first 32 page insert as a place to keep all the lists and info that I want to remember and have with me just in case. The first page is the index and you can see all the lists I keep in the refill. I usually assign one whole page for each list. This refill is for 2015, and I hope to start a new refill for 2016, updating info that needs updating and just copying over info that hasn’t changed. 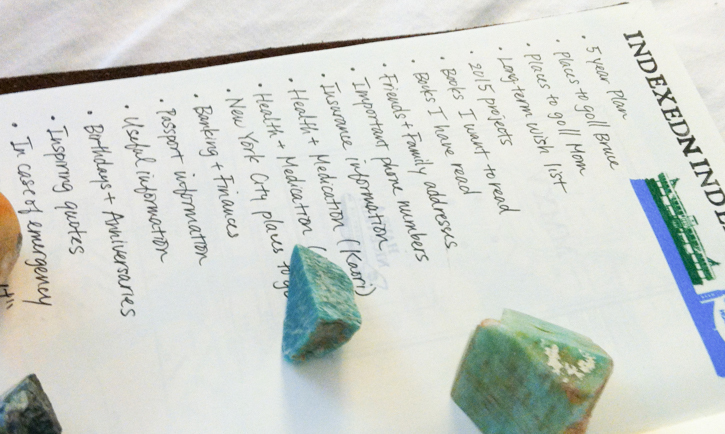 You see “5 year plan” is on my first page, and I got the inspiration from Baum-kuchen! 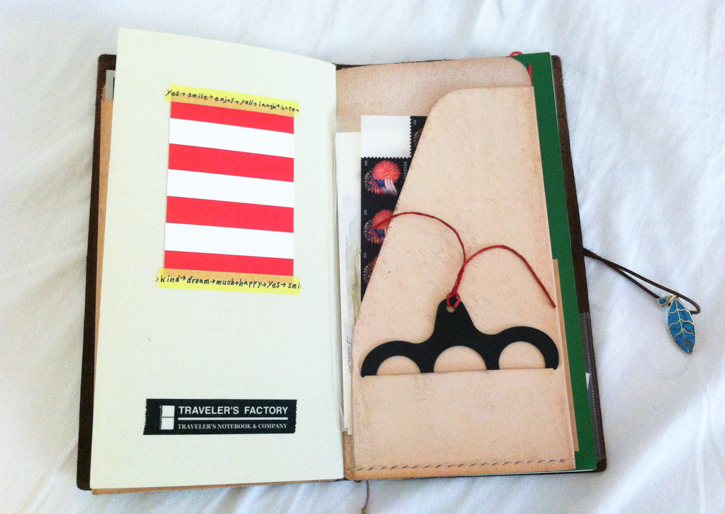 I use the right hand pocket of the leather folder to keep stamps, postcards and etc. The bottom pocket is perfect for storing this metal piece that I found at LOFT in Japan. Have you used it? 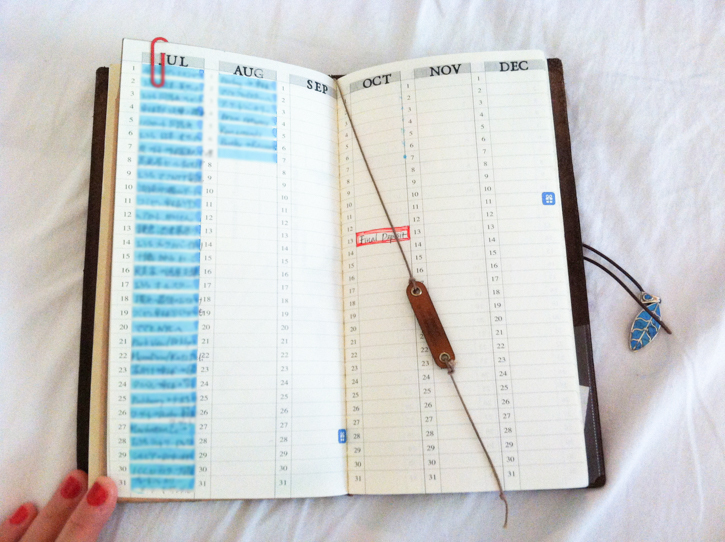 It is perfect for keeping the notebook open at the page you want it. The second refill is the weekly+memo (TN19). After trying the monthly one, weekly vertical one and the two together and etc... I have recently come to use just the weekly+memo. While I could and would write everything and anything if space allowed, in the interests of keeping the TN from getting too heavy and bulky, I decided to do just 3 things with my TN: scheduling, bullet list, and journaling (more like a record of what I did each day) and for me it is best if I could keep all these 3 things in the same place. I realized this weekly+memo can handle all 3 things although it does limit on how much space I can use for each thing. 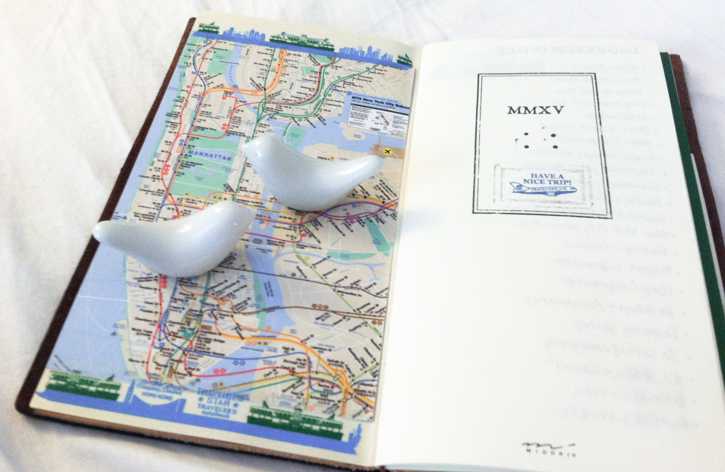 I use these pages to write the most notable thing about each day. It is fun to look back at a much later time and be able to glance at once how my life evolved on the scale of month to half a year. 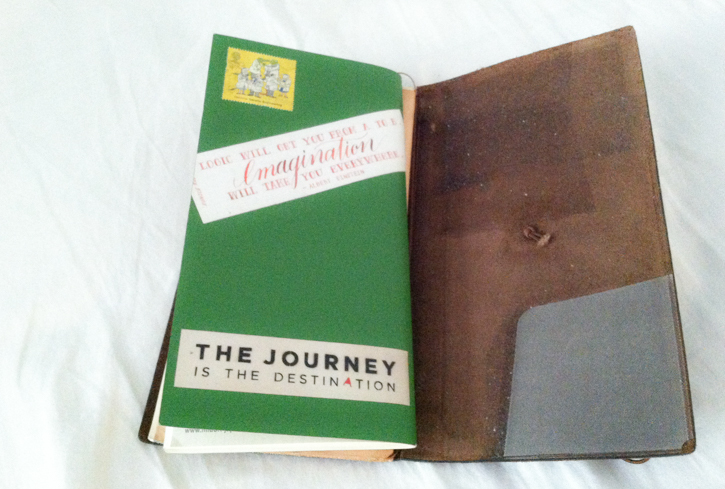 I LOVE Baum-kuchen original stickers, but especially, “the journey is the destination” sticker!!!! I hope you will design more inspirational stickers in the future!! Can you tell me more about the metal piece this woman found that helps to keep the pages open? Thank you!